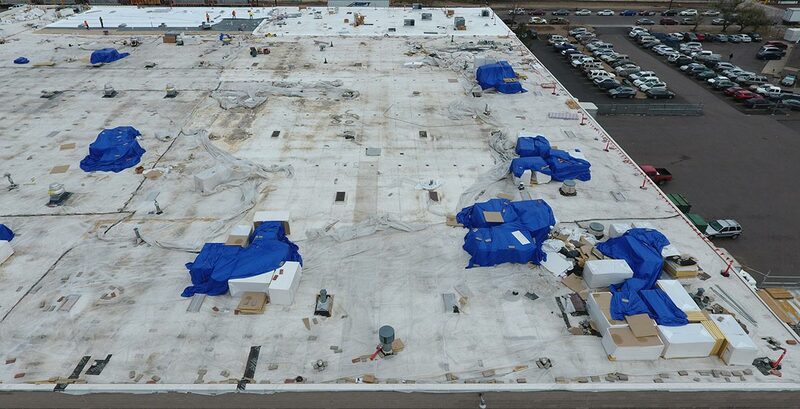 Hail is incredibly damaging, and ECO Roof and Solar has long been the preferred partner to help businesses recover from the hail damage done to their properties. When your property is affected by storm damage, you want to return to full operations as quickly as possible – we’ll be ready to help 24/7. After a hail storm hits, it’s not uncommon to see a flurry of fly-by-night roofing contractors looking to take advantage of the victims of storm damage. These contractors don’t have established roots in the area and will leave business owners stuck with a low-standard roofing job–if they finish the job at all. To protect you and your property, make sure you hire a quality roofing company that understands your needs and is familiar with your community. ECO Roof and Solar is highly qualified to help you get your roof repair or roof replacement promptly and professionally. Quickly examine the roof for missing or torn shingles. We have a great reputation with not only property owners, but with insurance representatives, too. We understand the insurance claims process and are able to take care of that ourselves in order to save you the headache, as well as the back-and-forth. We make sure you get everything your insurance entitles you to after a destructive hail storm.